Whether you're going to a special party, school dance or simply a fancy dinner, a junior semi-formal dress can set the tone for the entire evening and make you feel like a princess. There are many options for semi-formals so you can find one that is well-suited to your personal style. Although dress styles change from season to season, some styles stay popular year after year. There are several teen-oriented retailers that offer a nice selection of dresses for semi-formal occasions. PromGirl has a huge online store of dresses for all occasions. The collection of dresses found under the Semi-Formal category would be appropriate for any occasion that calls for a short to mid-length party dress. In addition to the latest styles and colors for homecoming dresses, this retailer has specific selections for events like graduation, sweet 16 and homecoming. The strapless hi-lo dress offers a classic look that will never go out of style, but is fun and flirty. It comes in light blue, and it is available in sizes 7 to 11. Even though the name says prom, DreamProm offers a wide selection of semi-formal dresses categorized by event, such as homecoming, sweet 16, party, etc. The styles on this site are more high fashion than you might find in your local stores, but the prices are still reasonable. For example, the A-line sweetheart dress is embellished with rhinestones to give it the look of a custom-made dress. However, the price tag is under $150. This particular dress also comes in your choice of 28 different colors and sizes 2 through 16. For teens wearing adult sizes, the dress is also available in women's sizes 14 through 26 for $9.99 more. You can easily change the look of any of these choices with different accessories and shoes. Also, hair can have a big impact on how formal your final look is. The beauty of junior semi-formals is that they come in a wide variety of lengths, materials and patterns. Since dress lengths and styles vary so much from season to season and even from one area of the country to another, the best semi-formal length is the one that looks good on you. Many girls are wearing shorter party dresses these days, as flirty skirts are back in style. If you are shorter, then a shorter skirt can also make your legs look longer. Girls who enjoy vintage dresses can wear a 1920's style Flapper dress to create a distinctive look. However, going too short can displease your parents and may even give you an appearance you wouldn't want, so be sure to check the dress in mirrors from all angles, including the back, where an already short skirt can ride up even more. In addition, take a seat, because the dress will rise even more when seated. Looking for something a little longer than a mini? Knee length junior semi-formal dresses can fill the gap between casual party goer and Captain's party diva. While knee length dresses are a little harder to find, they are much more versatile and can often be worn for multiple occasions, such as a school dance, graduation and semi-formal parties and gatherings. 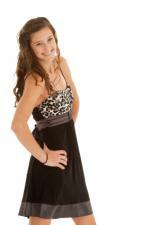 A calf-length junior semi-formal dress will help the wearer fit in at the prom or a fancy Christmas party. Calf-length dresses are also perfect for attending an opening event. In addition to these common dress material choices, any material that is shiny or sheer may be used in combination with other materials. You'll also find embellishments like sequins and rhinestones. Remember that the special event to which you're wearing your semi-formal dress is more about memories than anything else. It just so happens that finding the dress of your dreams helps you feel like a princess and builds on those memories. Once you've found the dress that you love, it's time to relax and enjoy your night on the town.